Years ago, we saw it as the eagle flies, in a small aircraft dipping its wings from side to side to show off the breathtaking mammoth chasm. “I want to hike down someday,” I passionately related to Rick. And here we were, after a night’s stay in the sleepy little town of Holbrook AZ, aiming for Flagstaff, a day trip away from realizing my dream. Breaking our rule of never rising before the sun, we left the Best Value Inn on old Route 66 (which is truly the best value in Flagstaff) at the crack of dawn, and had Emili climb for an hour and a half through Ponderosa forests. 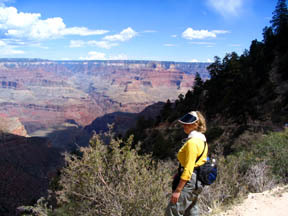 Approaching the south rim, we were once again in awe of the magnificence. We were immediately filled with the same overwhelming emotion as when we gazed up at Mt. Everest from the unparalleled view on Mt. Kala Patar in Nepal, or when our hearts lept at the sight of gigantic chunks of ice calving with shot-gun resonance as we stood dwarfed against the massive Moreno Glacier in Argentina. No matter how many times one views “the immensities”, the thrill never lessens, nor the humbling. The Grand Canyon, carved through the rocks of the Colorado Plateau, stretches out an unbelievable 277 miles in length, and between 8 to 16 miles across. 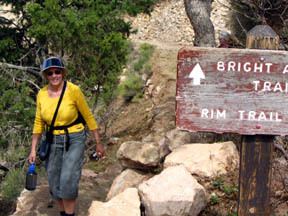 Finding the entry point to “Bright Angel Trailhead”, our boots were soon coated with the fine dust of the well-worn path; I, leading the way with our lunch and a litre bottle of juice, and Rick weighted down with a couple of four-litre jugs of water he insisted we needed. The extremely steep decline was self-propelling; the only discomfort was the constant jamming of our toes against our boots. Posted notices recommend adding three hours of ascent to every hour of descent. Noting the winded fitness gurus passing us on their way up made us uncertain of how we would fare on our return. A frantic yell, followed by a scolding drew our attention to a father and his 8 or 9 year old daughter as we rounded yet another spiral in the trail. Instead of staying to the rock-side of the path, she had gone over to the cliff edge to take a closer look into the abyss. With each step we became increasingly immersed in the multi-layered rock formations in a pageant of creams, rich toffee, russet, and charcoal, alive with the ever-changing play of lights and shadows. Variegated greenery bravely sprouted from jagged crevices on vertical rock faces. The hues of distant formations morphed into subtle mauves and a misty moss green. Man’s existence is so miniscule. 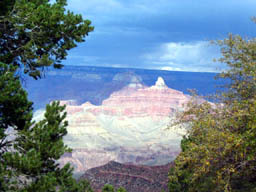 The oldest rock in the bottom of the canyon dates to as much as 1.8 billion years. The cap rocks are newer at 270 million years. 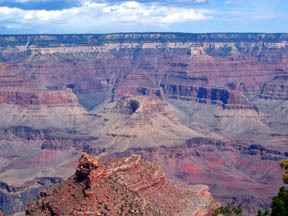 The canyon itself formed 5-6 million years ago when the tectonic plates pushed the plateau from sea level to 10,000 ft high, which amazingly occurred without much tilting of the layers. After descending two hours, we sat on boulders savouring a few energy bars, absorbing the beauty and magnitude, while Turkey Vultures playfully pursued each other overhead and squirrels scampered by, dropping with surefootedness down the side of the precipice. Flagstaff to Prescott on 89A is one of the most dramatic and riveting routes in the state, with lots of 15 mile per hour hairpin turns through the Mazatzal Mountains. Mother Nature was in a playful mood when she fashioned the landscape of giant red-rock sandcastles poking up from the forests of Piñon Pine, Juniper and Cypress. 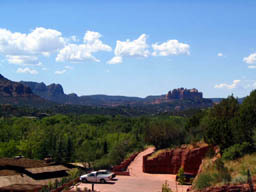 Sedona, nestled in Oak Creek Canyon was a good place to stop and view the surrounds. Sitting on a bench with a large ice-tea along the main street crammed with gift shops, we began to think our tea was laced with a hallucagen; Rick saw a big red “Snoopy” rock, and I pointed out a “steamboat”. An elderly lady on the next bench, overhearing our comments, congratulated us on correctly identifying the pet names locals have for two of the surrounding rocks; she then drew our attention to a “coffee pot” and a “merry-go-round”. The twisting roadway continued with dazzling views at every turn, climbing to 8,400 ft in elevation, then down to 7,000 as we pulled into Prescott. Whiskey row, the infamous street filled with old saloons, is the highlight of the town. Needing to wet our whistles, and fill the hollow in our mid-section, we sashayed through “The Palace” doors. “You are My Sunshine” and “She’ll be Com’in Round the Mountain When She Comes” were being pounded out by a rotund fellow on a corner piano. A crisp white-shirted bartender, needing suspenders to keep his trousers up from the weight of his gun-belt, grinned at us from under his Stetson, as he drew our Draft. A “purdy li’l gal” in frilly blouse and brindle skirt, hiked up to her thigh on one side, soon had our mouths watering with her suggestion of a “buffalo burger with the works”. 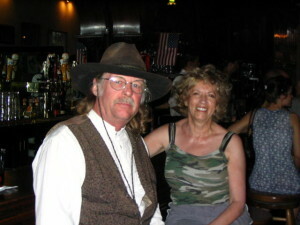 Feeling right at home bellied up to the same bar Wyatt Earp, Virgil Earp and Doc Holliday frequented in the 1870’s, we chatted with a local-yokel, Steve. He told us Doc once won $10,000 at a back room table in this establishment. In 1900 the hotel burned to the ground in a fire engulfing the whole street, but not before the patrons assessed their priorities and risked their lives to rush in and carry the bar, that we were looking at today, to safety. The terrain changed rapidly as we dropped further down south. By-passing “palm tree city”, Phoenix, as we had spent time there before, we headed right for Tucson at the north end of the Sonora Desert Valley. Mesmerized by the giant saguaro (Carnegiea gigantea) columnar cacti, found in Arizona more than anywhere else, I had the intense desire I always have when encountering a huge arboreal specimen; to “hug-a-tree”. Up close, I changed my mind, deterred by the two inch spines around their trunk, and also not wanting to disturb the Gila Woodpeckers and Gilded Flickers that excavate holes in the body for nesting sites. Bats survive on this cacti’s succulent flesh, which is 90% water. The huge saguaro are a marvel, resembling irregular-branched candelabra reaching 15 to 50 ft in height out of the dry desert, with only a foot of shallow roots beneath the surface of the soil. In May and June the raised arms are lit with yellow-centred white flowers during the cool desert nights, which extinguish themselves by closing up mid-day. Ripening before fall, the green oval fruit with a bright red pulpy flesh when split, was an important source of food for Native Americans. Each fruit contains a prolific 4,000 seeds. This fascinating plant may live to 200 years old and if in the 50 foot range with several branches may weigh 8 tons. Instead of hugs, I patted quite a few. 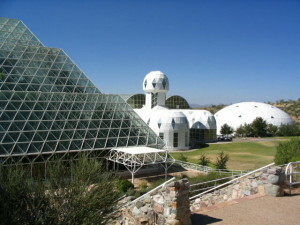 A visit to Tucson Botanical Gardens for information on Sonora Desert plants did not take long. Rick has two site-seeing allergies – large plots of flora with little Latin name plaques, and museums with too much pottery. Besides, the rest of the world was represented more than local growing plants. The 5½ acre area, of which we visited approximately half, was filled with scarecrows in costumes. Seeing a wonderful saguaro cactus towering in the distance, I raced over with my camera, only to find it was half hidden by a 5-foot plastic person with butterfly wings. Darn. The Davis-Monthan Air Force Base was nearby. 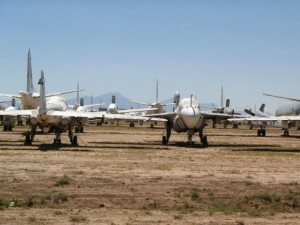 Since Rick had suffered the gardens, I feigned enthusiasm for the aircraft graveyard of old World War II relics, as well as jets used in the Vietnam War. Seeing over 5,000 aircraft standing in ominous, silent rows turned out to be both strange and fascinating. On the way to Tombstone, we took a detour to Arizona’s second most famous attraction; Kartchner Caverns State Park. A tribute to Mother Nature’s greatest virtue; patience – it all began three hundred and thirty million years ago when a shallow sea covered the area depositing layers of sediment that eventually hardened into limestone. A million years later, some of the rock rose to form mountains, other portions dropped. Lowering groundwater left vast air-filled rooms in the down-dropped limestone. In an ongoing saga, that started approximately 200,000 years ago, water laden with carbon dioxide from the air and soil, absorbing minerals on the way, reaches the caves where the trapped carbon dioxide escapes, and the water, no longer able to hold the dissolved minerals, release their load with drops, seeps, condensations and pools growing the beautiful “speleothems”. Very delicate “soda straws” are suspended from the ceiling in thin, white strands; in the “Throne Room” of the cave; one measures an amazing 21 feet. Stalactites, in shades of caramel and taupe, hang like icicles from the ceiling; stalagmites rise from the cave floor formed by dripping water from stalactites, and columns are created when a stalactite and stalagmite meet. As I stopped to marvel at Kubla Khan, a massive 58 ft tall column, three drops of water splattered on my head; cavers feel they are kissed by the cave with these lucky drops. Reddish iron saturated deposits between layers of waxy white in a wavy pattern is perfectly named “cave bacon”. Smooth, opaque canopies produced from a slow flow, glimmer with mother-of-pearl translucence in the light. Helictites are twisted formations, squiggled at all angles from the ceiling, seemingly defying the law of gravity. The “Big Room” cave was still closed, so as not to disturb the 1000 bats which come to breed and raise their young from April through September. During this time it is estimated the bats consume a half ton of moths, flying ants, mosquitoes, and termites. Their excreted waste, large guano piles, are the bottom of the food chain upon which a hierarchy of life forms depend for survival. These 2.5 miles of living limestone caves were first discovered in 1974 by cavers, Gary Tenen and Randy Tufts. Looking down, from the constructed pathways, at their original trail recessed in the muck across the cavern floor, it is easy to imagine their elation at such an incredible find. Luckily the mire was not like quicksand, but claylike, and being professional cavers, they knew to even their weight on all-fours; otherwise they would have sunk to their hips. A twenty foot pole pushed into the mire does not reach the bottom. The forest of Ocotilla Cacti (Coach Whip), with tendrils weaving in the breeze, growing on top of the hills in the area, is a good indicator of caves beneath, as this particular cacti love a limestone base. This phenomenal discovery was kept secret for 14 years, until the Kartchner owned property transferred to State Park lands in 1988, and a thorough investigation could be conducted and precautions implemented to be sure the delicate balance of the cave would remain in near-pristine condition, even with scores of human visits. In keeping with the preservation guidelines, photos are not allowed in the caves. Thanks to Ellen Bilbrey, head of Public Relations, an inside picture of the “Big Room” appears in this blog. “The town too tough to die” was our next destination. Founded by a gutsy prospector back in 1879, Ed Schieffelin, who walked alone through the valley rife with Apache raids and bandits on his quest for riches, was told how foolhardy he was by the soldiers at Fort Huachuca. “All you’ll ever find is your tombstone,” they jeered. When he found a rich silver vein, he ironically called the boom town that followed “Tombstone”. From its flinty beginnings, the town showed resilience to catastrophes. 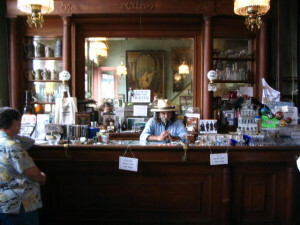 Prompt rebuilding took place after two major fires destroyed the business area in the early 1880’s. When the silver mines closed permanently due to unsuccessful attempts to keep water from flooding the shafts in 1886, the town doomed to become a ghost town eventually rebounded as a living museum of life in the 1800’s. Stagecoaches and covered wagons roll down the streets, horses are tied to hitching posts, historical saloons like Big Nose Kate’s are raring for business. Flamboyant Kate was known to be Doc Holliday’s girlfriend, as well as every other man that could afford her. 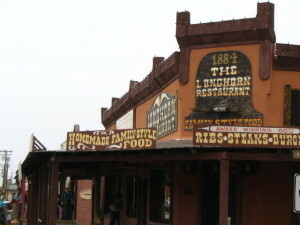 A fine supper at the Longhorn Restaurant and a brief look around the main streets of Freemont, Allen and Toughnuts were all we got in before the desert downpour; hmmm, sounds rather oxymoronic. The heavy rains continued all the next day, an anomaly, we were told, caused by the tail-end of a hurricane tormenting Baja, California. We managed to wade to “The Bird Cage”, the lusty den of iniquity, which by popular demand was open 24 hours a day consecutively for 9 years during Tombstone’s heyday. It brags as having the longest on-going poker game lasting 8 years, 5 months and 3 days with a minimum purchase of $1,000 worth of chips to play. Before closing its doors in 1889, 26 people died in 20 gunfights, as evidenced by the 140 bullet holes riddling the ceiling and walls. The popular refrain of a song that became a national favourite, “She’s only a bird in a gilded cage”, was written for the “tainted angels” who entertained guests in cage-like cubicles suspended from the ceiling on both sides of the dance floor, theatre and casino. Worn black and white pictures of some of the main attractions adorn the walls; such as, Blonde Marie, Lizette the Flying Nymph, and Jo (Josephine) Marcus, who became Wyatt Earp’s third wife. After the silver mine closed, the Bird Cage was boarded up for 50 years, making it the only building in Tombstone in its original condition, complete with layers of grime and echoes of laughter, yelling and music. As I looked up at the tattered stage curtain, I whiffed the fleeting odour of old cigar smoke and booze. Impossible. Neither has been allowed on the premises since it has been re-opened. Strange. I called Rick over to see if he could detect the same scents. No, he did not share the trick my nose was playing on me; he felt it was the dampness. The redolence continuing to waft my way; there is more than dust imbedded in these old walls. 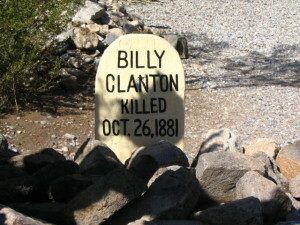 Tombstone personified the American Wild West at its best and worst, the illusions and disillusions. Wells Fargo stagecoaches were the main mode of mail deliveries and passenger service in or out, travelling at an average speed of 5 miles per hour (when not being chased by the fearless Apache leader Geronimo, or outlaws). If all went smoothly it would take 22 days to get from Tombstone to San Francisco. 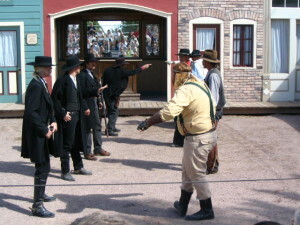 A population of hard working and harder playing miners, ranchers and businessmen, further spiced with cowboy bandits, lapped up the ample vices this fast growing town had to offer, with a tendency to settle disputes with their trigger fingers. It was often difficult to tell the good guys from the bad; the OK Coral shoot-out is still in contention in this regard. The sky was blue the following morning as we moseyed over to the site for a re-enactment of the infamous gun-fight. The Earp-Clanton feud had been gaining momentum for months. The Clanton gang were the cowboy contingent. Before the town came into being, they had free reign over the territory. They were known cattle rustlers and horse thieves; in fact, only a day before a Clanton was seen riding a missing horse of Wyatt Earp’s. Sheriff Behan, of Cochise County, seemed to side with the Clanton’s; could jealously have been a factor as his favourite, Josephine, had her eye on Wyatt. Wyatt’s reputation for cleaning up Dodge preceded him. The businessmen in the community were behind the Earps to set this gang straight. The struggle for control over Tombstone was on. After the City Marshall Fred White was accidentally shot, Virgil Earp was appointed to the position by Mayor Chum. October 26, 1881 word reaches Virgil of key Clanton gang members ignoring the new “no guns in town” law. Deputizing his brothers, and along with their friend, Doc Holliday, the menacing foursome dressed in black, coat-tails flapping in the breeze, Stetsons shading their eyes against the blazing sun, marched to the alley behind the Ok Coral coming face to face with Ike Clanton, Billy Clanton, Tom and Frank McLaury. The tension was thick as molasses in January. Virgil told them they were under arrest and to raise their hands. Frank McLaury shouted a reply, whether agreement or insult, no one will ever know. In a half a minute 27 shots were fired; when the smoke cleared, only Wyatt was left standing. Ike Clanton had run through Fry’s Photography Shop nearby, and kept on running. Frank and Tom McLaury, and Billy Clanton were dead; Doc Holliday, Morgan and Virgil Earp were wounded but recovered. The Earps and Holliday were charged with murder; the testimonies by witnesses fell on both sides of the fence; Judge Spicer found the Earp’s not guilty. By December of the same year, Virgil was gunned down in retaliation while making his rounds as Marshall, leaving him a semi-invalid, and shortly after Morgan was shot to death while playing pool. Though many of the 250 graves at “Boothill” are marked “Unknown”, the cemetery’s name was derived from the large number of the bodies buried here between 1878 and 1884 known to have died with their boots on. Boothill was a fitting end to our Tombstone escapade. A few days in Yuma, known as the poor man’s Palm Springs, and we are California bound. Our Arizona experience is rated “A+” in our books. “Here lies Keith, beneath the wreath. Wrote all day, for his pay. Lived life long, ya can’t go wrong.